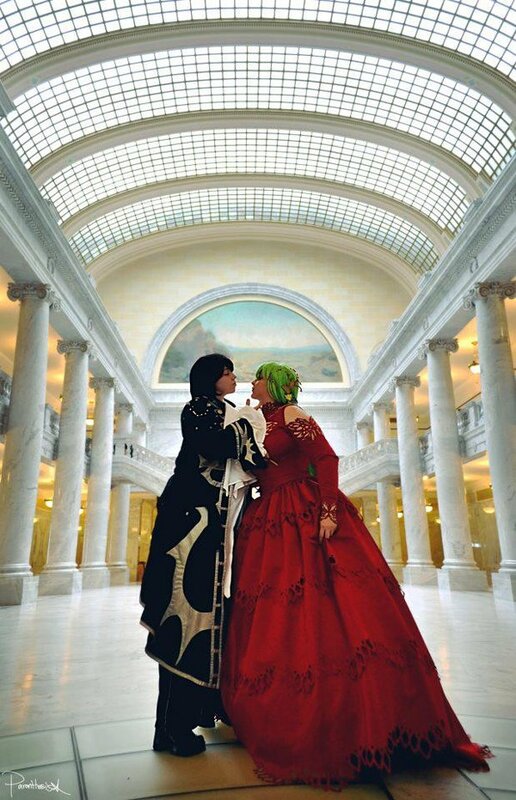 Editor Note: Green Jello Cosplay was chosen as the Representative Team at Nan Desu Kan to represent the Mountain region of The United States at the 2014 U.S. World Cosplay Summit Finals at Anime Central 2014. 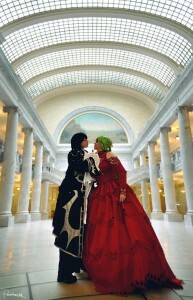 Green Jello Cosplay is comprised of two Utah Cosplayers Elrowiel and Pannon. The winner of this competition will travel to Japan for the International World Cosplay Summit and compete for America against representatives of the other countries involved in the WCS. 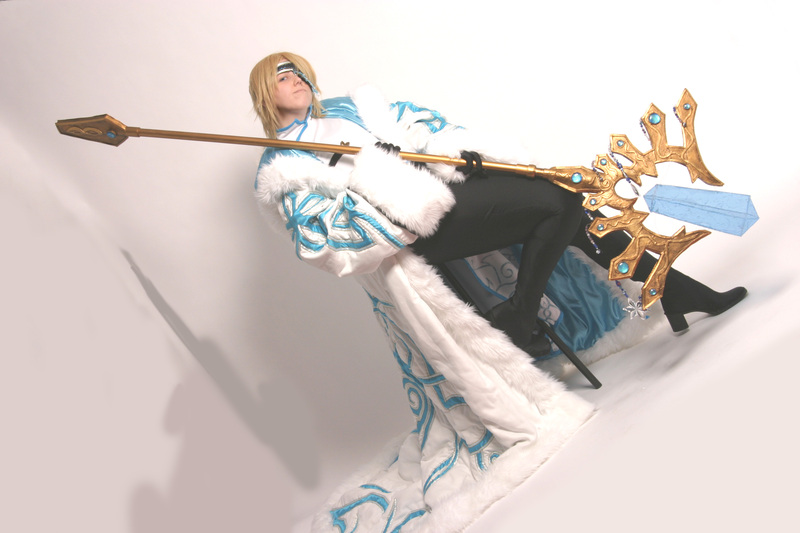 I’ve been cosplaying since 2007. 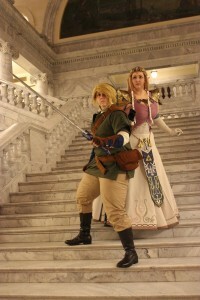 I attended a couple cosplay gatherings locally before I ventured down to Anime Vegas and have been addicted ever since! I started cosplaying in 2001 at our local sci-fi convention. At the time I didn’t know much about the hobby or about sewing, but I did what I could with what I knew! I went as Selphie Tilmitt from Final Fantasy VIII and even though it wasn’t an anime-centric convention, I still had a blast and the response was really positive. I’ve enjoyed it ever since. I’ve always been interested in costumes to be honest, but it wasn’t until I stumbled across a few cosplays online that it occurred to me that I could make costumes from my favorite characters! I really got into it when I started attending conventions out-of-state. I went with friends from our local anime club and we were all really beginners at sewing, but we went as groups from our favorite shows and video games and I loved being able to meet others at the con who shared the same interests. Over the years, I’ve made a variety of cosplays, but I think my favorite would have to be the one I just finished. I’ve been working on the patterns and collecting fabric for Twilight Princess Zelda since the game art first came out. It’s been years of learning and working to make it happen! My favorite is definitely Princess Serenity from Sailor Moon. She was my favorite growing up and her character had a really positive impact on me as a teen. I always had a goal to make her dress someday and I’ve always loved the design, so when we decided on Sailor Moon for last year’s WCS, I was thrilled. It’s been a dream of mine for a long time! A large part of it is the design. That’s usually what pulls me into an anime or video game. If I like the designs, I’m going to be more likely to play/watch. Once I’ve seen/played it and they still appeal to me as a character, I start considering them! I tend to pick ones I relate to or characters with really fun designs. We don’t really have a set method. Typically Elrowiel will like a certain character or type, while I will like another. Of course there are always characters we both will love too! I think it just depends. I like a lot of the girly girls or punky boys, but if it’s for a performance, we still try to pick them based on how much we like them, though also on how well we can tell a story. 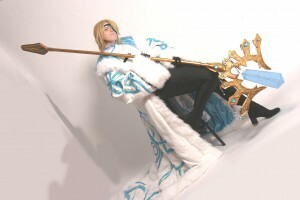 If it is just for fun, we will cosplay whichever we like most or find most challenging, or any number of other reasons! I love cosplaying because of the community! I’ve met my very best friends through this hobby. And have met many more that I would never have had the chance to me otherwise. I have gotten to travel around our country and work with so many amazing artists, It’s truly an experience I wouldn’t trade for the world! We get asked this one all the time and you would think it would get easier to answer, but really there is no one reason. I personally love it for the friends I have made, for the skills I have learned, and for the thrill of performing. No other hobby I’ve been a part of has changed me so much as a person and helped me break out of my shell. I wouldn’t be who I am today if I didn’t cosplay. Ah!! Yes! I’ve been slowing churning away at the Artbook version of White Queen Ester from Trinity Blood for years! Despite having the materials and beads and such to make it…I never quite start. In all the things I make during my time cosplaying, I don’t think I will ever make anything more challenging that that is going to be. I’m really excited to take it on, but at the same time I’m terrified to start! Because of that, it’s still a dream cosplay! Oh, definitely! I keep a running list. I have been dying to make Ultimate Form Madoka, Elsa from Disney’s Frozen, and Chun Li from Street Fighter! Also, princess dresses. Elrowiel got me hooked on Princess Dresses! Oh boy, That’s hard to answer. I try to learn something new on every cosplay I take on, and because of this many are challenging for different reasons. 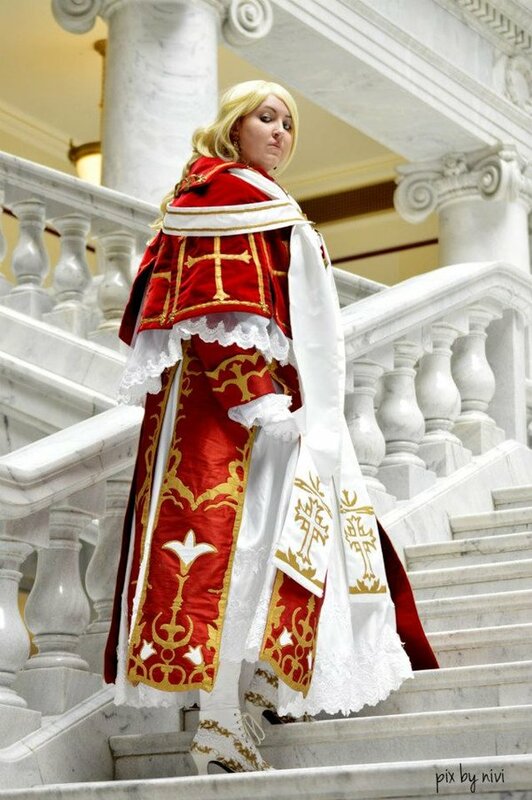 I think overall, though, my Cardinal Caterina from Trinity Blood is the most difficult cosplay I have taken on. Years of work and she’s still technically not done. We have a saying in Trinity Blood cosplay, that they are never actually finished, just at various stages of wearable. And after taking one on, I definitely agree! Construction-wise, probably the most complicated was Seymour Guado from Final Fantasy X. His robes seem to levitate around him in places, so constructing a wire-frame that went inside the lining was crazy-hard. And that wig! Definitely the most difficult wig I have attempted. Elrowiel: I’m sort of a fabric hoarder, so I’m always collecting for things. 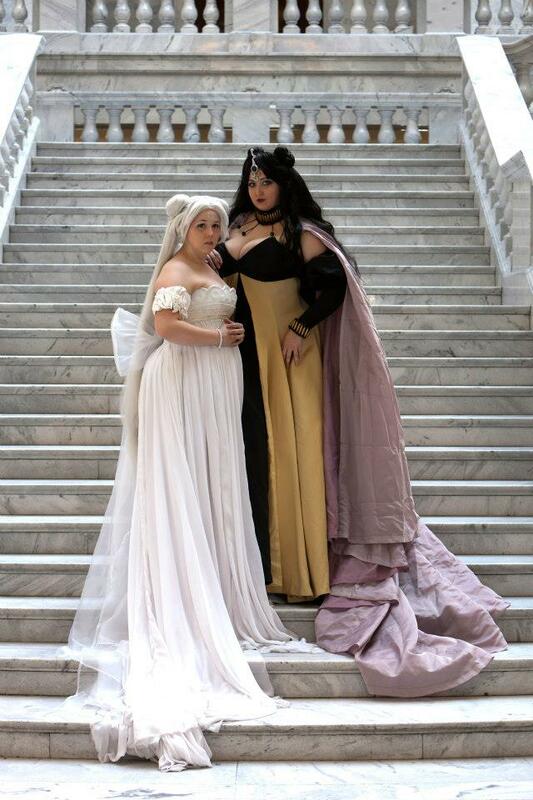 Currently I have fabric pulled for Carmilla from Vampire Hunter D and Beatrix from Final Fantasy IX. Currently my project has been Princess Garnet til Alexandros XVII from the game Final Fantasy IX. It has been a huge undertaking; Elrowiel and I had actually thought to do these costumes for WCS last year, but we struggled with a storyline for the skit and thought they would be more fun in a group. I’m also working on Link from Twilight Princess and slowly piecing together Elsa from Frozen. I think I’m most excited for Carmilla. I’ve had the fabric for ages and I have a group of friends putting costumes together to match. I’m looking forward to the challenge as well as all the time we are going to spend as a group both working on these and wearing them at the convention! Oh man, that’s hard to say. I am super excited for Elsa and Garnet. I love both characters and their costumes are amazing! I hope mine turn out alright, but I’ve had a lot of fun crafting them! Hmm. Well, for me there isn’t really a “retire.” That makes it sound like a job! If I lose interest then I will stop, and if I find something else I want to make or do, then I will do so. As long as I enjoy what I’m doing, then I plan to continue! I never really gave it much thought. I feel like the hobby has become such a big part of my life that it’s strange to think of it not being there. I think even if I retire from competition, I would still make and wear costumes. It’s just too fun not to. Well, not really. I wear pieces on occasion if they can be incorporated into my everyday style, but I don’t go out of my way to do so. I… may have more than considered it. You would be surprised with how many items from my cosplays are easy to coordinate into my wardrobe. I may be known to sneak my Barnaby Brooks Jr. pants on with my favorite t-shirt or my Persona 4 gyakuran on when it’s chilly out. I tend to make everything. For me, that’s part of the fun. I love the hunt for the perfect fabric and then thrill of patterning it all together! Of course, that’s just me. There is nothing wrong with buying, I just take part of my joy from fabricating them. I almost always make them. I can actually name the 2 I’ve bought; way back when I started out I got a uniform from D.Gray-Man and just recently at a swap meet, someone traded me a Hellsing uniform for some of my old cosplays. Everything else I’ve done has either been found and altered or (more likely) made from scratch. I think I’ve stayed about the same, to be honest. I’ve always tried to be the best of my skill level. I work to improve each time I take on a cosplay. I think a wider variety of available materials has made a great many things much easier! I guess you could say that performing changed the way I cosplay. Even before I did a lot of competition, the cosplay group I was part of was in charge of performances and half-time shows at our local con. I rarely did photoshoots – I was always so much more excited to perform, which was what got me interested in World Cosplay Summit. The performances are just amazing! I generally tend to stick fairly close to source material if I’m going to be doing an actual character and that’s mostly just personal choice. If I’m going to make it, I want to try and make it as exact as I possibly can. There’s usually positive and negative for any interpretation. For any one character, a dozen people will see it a dozen different ways. I feel like none are more wrong or right than another, but people will always have opinions on what they prefer. Personally, I try to add a little detail that might not be in the original source. I research the time period it is from, or the type of clothing, and maybe learn a new style of stitching or add beading or textures to give it life. I love Amano’s artwork for that reason; it can be interpreted or embellished in so many different ways and they all look so beautiful! For the most part, I think there has been a positive reaction. And honestly, I try not to worry if there is anything bad. If I am pleased with the work I have accomplished and had fun doing it with friends, that is enough for me! I’ve always been somewhat of an introvert, so while I love to perform for groups or teach classes or sing, etc, a lot of times I am still pretty shy when face-to-face or one-on-one with someone. Elrowiel has really helped me to come out of that, though, which is one of the reasons she is such an amazing partner! Online, I try to reply to any comments or questions for sure! I love being able to help others by explaining various techniques on sewing or prop-making. I did Rapunzel from Disney’s Tangled a year or so ago, and the little kids reacting to it was the cutest thing ever! Boys and girls wanted to see the princess and take pictures! It was adorable. For our local con, we got to perform half-time shows during the cosplay contest. I have so many amazing memories with that perfomance group, I couldn’t even choose one. I loved performing and running events with them! Another favorite was our Umineko performance from WCS 2 years ago! We had so many special effects and magic tricks that we had a million backup plans in case one didn’t go off. When I caught Elrowiel and pulled the last scarf from her hair, I remember thinking, “Holy crap! It all worked! !” There were so many things that could have gone wrong and they all went right! It was awesome! The following year when we did Sailor Moon at finals in Texas, we had a similar experience. I remember saying to Elrowiel before we went on, “I don’t care if we win or lose, I just want everything to happen the way we practiced. I want to show them the best performance.” And, while we had a small hiccup or two, I was so happy with it. We came off stage smiling and hugging, it was awesome! Do you participate or have you participated in any cosplay contests (Convention, online, etc) if so, have you won any awards for your cosplay? If so, what kind and/or where did you win them? I definitely participate in contests! I’ve a fairly competitive person. Through masquerades I’ve met some truly amazing cosplayers. The green room is the very best place to meet people! I always go into these trying to be the very best that I can be, but never expecting anything. I think as soon as you expect to win, you lose the true spirit of competition. You never know what anyone else will bring, and you don’t have control over other people. The only thing you can do is create and perform to the best of your skill level. As long as I know that I have done that, I’m happy. Losing is just a challenge to do better the next time! Oh, wow. Well, since competition and performing are some of my favorite things, I can definitely answer with a resounding “YES!” It feels weird not to be in a contest when attending a con. Some of my best friends were made in the green room at a masquerade as we all wait to go on and share our nervous jitters! I’ve won many awards, not sure on the exact number. Mostly at cons, a few online, but I think I felt like I’d finally made it to Master class when I took Best in Show at Anime Los Angeles with some friends doing a Heart no Kuni no Alice skit. It took a lot of learning to get to that point, both in improving my craftsmanship and in improving my stage skills and presence! My first actual convention was Anime Vegas 2007. I had seen all sorts of cosplayers and photos on the internet, but was really nervous to do it myself. I had never been before and I was afraid I would be the only one dressed up. I almost didn’t dare leave my car! Thankfully my group managed to convince me that I was being dumb and we entered the convention. It was unlike anything else I had ever seen! I was addicted almost on sight. I entered the masquerade there and fell in love with performing in things I had made. I re-awakened the Theater geek in me. I knew from there it was the beginning of the end! The first anime convention I went to was Nan Desu Kan 2002. 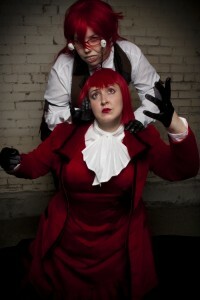 I feel that cosplay is a personal experience. There is no one right way to enjoy cosplay. If you like crafting, then go for it. If you want to buy something and be part of the fun that way, do it. If you do something anywhere in between, then awesome. I think the only time that should really come into play is when masquerade and competition is involved. When the judging criteria is based on if you made you costume or not, it’s definitely important. Outside of all that, it really doesn’t matter either way! I think as long as you are having fun, it doesn’t matter! Cosplay means many things to many people. Some just like wearing, some like creating, some like taking photos. None of them are more right/wrong/pure than others. I prefer to make my own. I take pride in creating something, in being able to say I made it and knowing I worked my tail off to make it my own. But others will put just as much love into theirs in other ways! I definitely don’t mind when people do it! I tend to stick to photoshoots or stage when doing it myself, but it can definitely be a lot of fun if you have a group of people good at improv! There are so many people I hugely respect in cosplay and would absolutely love to shoot with. It’s not really a small list. I’ve never really had “cosplay idols,” but when I’m impressed with a costume, I tend to really want to see it in person! I honestly don’t follow a lot of well-known or famous cosplayers – I don’t pay a lot of attention to that. I am always thrilled to cosplay with others who love the same things. At ALA, we organized a group on-the-fly who just happened to show up with Guilty Crown costumes that matched what I’d brought. It was amazingly fun and I loved getting to know them better. I guess you could say my dream group that I’ve always wanted to shoot with would be anyone from Sailor Moon, though! Or Final Fantasy VII. I would love to do that someday! I don’t think there is just any one list of challenges. Since it all depends on what you are trying to get out of it. I think universally it can be scary to go out into the world dressed up. Even though I was in theater as a teen and such, I still had to overcome a lot of worry and break out of my shell to be as comfortable as I am today. I honestly think it has been the best thing for me. I’m so much more self-confident than I would have been without it! Finances! Cosplay is an expensive habit. I feel really lucky, though, that the community has grown so much. It makes it easy for us to exchange ideas and tips and share with others. I have learned so much, but I still have a long way to go! 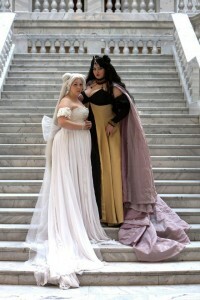 How do you deal with the constructive criticisms that you receive on your Cosplays ? If it truly is constructive, then it’s worth at least listening to. If I had to do something a specific way, then I usually reply with why I did something one way or another. I feel like there is always something more you can learn, no matter what level you are at in construction and technique. Who knows, you may be able to use the knowledge they give you in another project! I love when it is constructive! It is how I learn! One of my favorite judges from cosplay contests in the past would always offer alternative ways that something could have been made. Not saying one was better or worse, but simply giving the contestants ideas for other techniques to practice or learn. I loved that. Sometimes it can be really hard to get ego out of the way and accept that a costume can be improved or needs changing. It’s not always easy, but we learn so much from it! Don’t be afraid to ask questions and research, research, research! I’ve learned a ton by spending hours on the internet looking up one thing or another. Also, make friends. Make lots and lots of friends. I’m happiest in cosplay when I’m surrounded by others that share my passion! NO ONE is perfect the first time. If you want to improve, the only way is to practice and keep at it. Anyone can become great over time; everyone has that potential in them! The important thing is to never stop learning and never give up! Cosplay and costuming definitely consume a large portion of my life, but when I’m not doing that I like to read. I tend more towards the fantasy genre, but I’ve been known to pick up other options! I also love hanging out with my friends and roommates. Even if we are working on cosplay or such, I love just being with them. Cosplay may have brought us all together, but it was only the start of beautiful and meaningful friendships. I draw. I sing. I play video games and watch horror movies and laugh maniacally. I play a couple instruments. I collect figurines, guitar picks, and souvenir pennies. Oh, and magic tricks. I’m a little bit of a pyro, as Elrowiel can probably attest. I have a little corn Snake named Cayman Pepper that spends most of his days sleeping under his sun lamp and a little Black Bombay kitty named Mischief. Mischief likes to dive under fabric and patterns when I’m not looking and requires multiple kitty snuggle breaks while I’m working. I’ve never met a more needy or snuggly animal in my life! I do a lot of period research. Does that count? I quite often will have period flavor to my costume construction. I used to do magic tricks, which helped a lot in our Umineko skit. I paint, which helps me with backgrounds. I used to edit AMVs too, actually, which has helped a lot in our intro and performance vids. I love watching plays and live shows, though, that always give me great performance ideas!! Thank you to everyone that has been a part of my life (cosplaying or otherwise). Your support and love has made me the person I am today. It’s been a rough road the last couple years, but I wouldn’t trade the relationships and memories I’ve made because of that for anything.